I’ve been writing a lot about peer feedback lately, and here’s why: It can do great things for your team, or it can do bad things for your team. So let’s get it right. Let’s make it a force for good, rather than bad. In my previous article, I provided three tips for driving the positive outcomes of using peer feedback as a tool for improving your team performance. As a manager, you have to manage how peer feedback is given. If you manage this, your team as a whole will drive for improved performance, not just you. –A new team member may not be the best person to give feedback. The new team member may not know what the right course of action is. However, that person is also a candidate to receive peer feedback, and hence will begin to experience the culture of giving and receiving peer feedback. But when first starting, perhaps you should not unleash the expectation to give peer feedback right away. –Similarly, another team member may have trouble using behavior-based language. Don’t encourage this person to give peer feedback. Peer feedback can be a tricky thing. When it is given indirectly, such as via 360 feedback surveys, it potentially makes a mess that is hard to clean up. But what about when peer feedback is directly given? There are pros and cons for peer feedback directly given, and perhaps the biggest argument in favor of direct peer feedback is that it multiplies the amount of performance feedback an employee receives. The Manager by Design blog knows how badly given feedback can ruin so many things about the work environment. And there is an epidemic of badly-given feedback out there, and for this reason I have some hesitation to recommend in this post that the lines of feedback be increased, since it could be increased badly given feedback. Peer feedback is frequently given via indirect surveys, perhaps as part of a 360-degree feedback program. I would like to argue that this doesn’t really count as peer feedback, since it is time-delayed, indirect, and frequently non-actionable. I’m more in favor of direct peer feedback, since it is specific and immediate, can be focused on improving performance and teamwork. However, there are some reasons to be wary direct peer feedback, as I detail in my previous post. Look familiar? 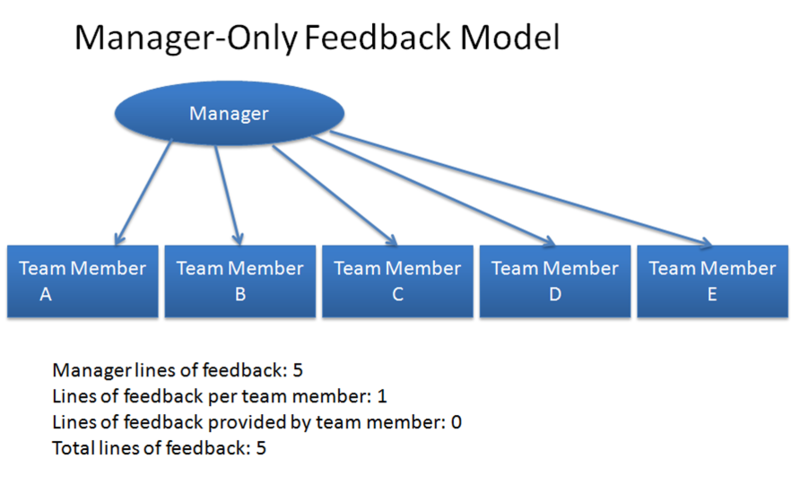 This is the popular conception for how employees receive feedback on their performance. It is predicated on the belief that the manager has enough expertise in all the areas of the team performance to provide feedback, and the manager actually has the skill to provide feedback, which, alas, is not always the case. When most of us start a job, this is the general mental model that we have. After all, the manager is the one who evaluates our performance, and knows the expectations for performance! Employees expect to receive feedback from the manager on performance.